The Scale field allows users to select a number from a set of radio buttons. 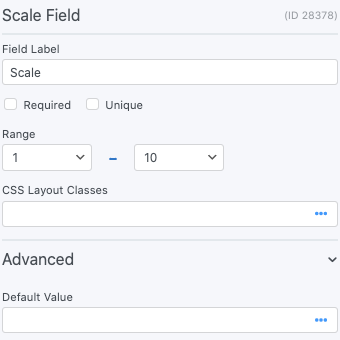 In addition to the standard field options, Scale fields have a few field-specific options. Browse the sections below to learn more about the options specific to Scale fields. Set the range for your scale. Setting a lower limit of 1 and an upper limit of 5 is very common. Display options as stars instead of radio buttons. See the Star Ratings page to learn more about this option. Set a dynamic default value in your Scale field. If you would like to retrieve a value from an entry see the Get a Value From an Entry page. If you would like to set a default value, see the Default Values page. Display the value submitted in a Scale field in a form's confirmation message, email, or View. Display value: Display the value submitted in a Scale field.